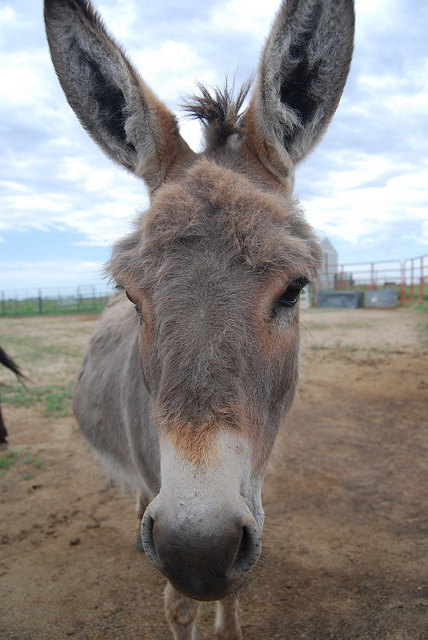 Tailspins | I'll alienate you with my opinions, then win you back with cute animal pics! ~ I'll alienate you with my opinions, then win you back with cute animal pics! So over the past 5 months, Kiwi’s behavior problems have really ballooned. It’s been very hard on me because I got so much blame from others that it was “all my fault”. Kiwi’s eye vet said I needed to get her into obedience training. I had been training her since the day I brought her home, but when she developed her anxiety at about 5 months old, she became too anxious to train outside, where she needed her training the most. The dog walker I hired said her behavior problems were all my fault because she “didn’t get enough exercise”. HELLOOOOO! I paid this guy to walk her every day, and two months passed before he reveled he hadn’t even left my driveway with her. Why? Because of her behavior problems she was too spastic to walk on a leash. If the guy I’m PAYING to exercise her can’t exercise her, how did he propose I should exercise her? That dogwalker no longer works for me. When Shannon the breeder said that another dog from the same mom (born a year earlier) had Kiwi’s behavior problems, I felt validated. Finally, someone who wasn’t blaming ME! Yesterday I got two things for Kiwi: Her Clomicalm came in, and her Thundershirt arrived. The thundershirt didn’t help too much at all, but I’ll keep trying with it. And I gave her the first dose of Clomicalm last night, which the vet says may take up to a month to work. I just want Kiwi to calm down enough where I can take her for walks without worrying that she’ll hurt me or someone else. 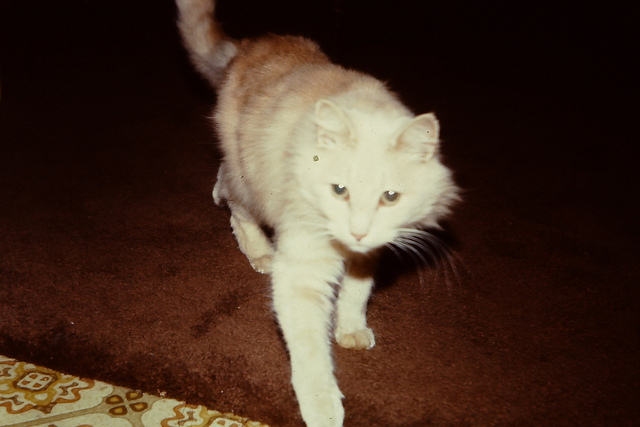 Scamper was an awesome cat. We got him when I was in 5th grade, and he unfortunately died of antifreeze poisoning during my second or third year of college. Good ol’ Scamper! It is only 5 a.m. Wait – oh crap! That’s me! My love of animals, especially dogs. I remember getting shots as a kid (probably pre school age, maybe before) and coming out of the doctor’s office crying, and I saw a guy walking a gray poodle down the street and all I wanted was to pet that dog but my mom wouldn’t let me and she had to drag me away screaming. How cool would it be if it caught on that a therapy dog would be present at vaccination clinics for kids, and their “reward” after getting a shot was to be able to snuggle and draw comfort from a dog? 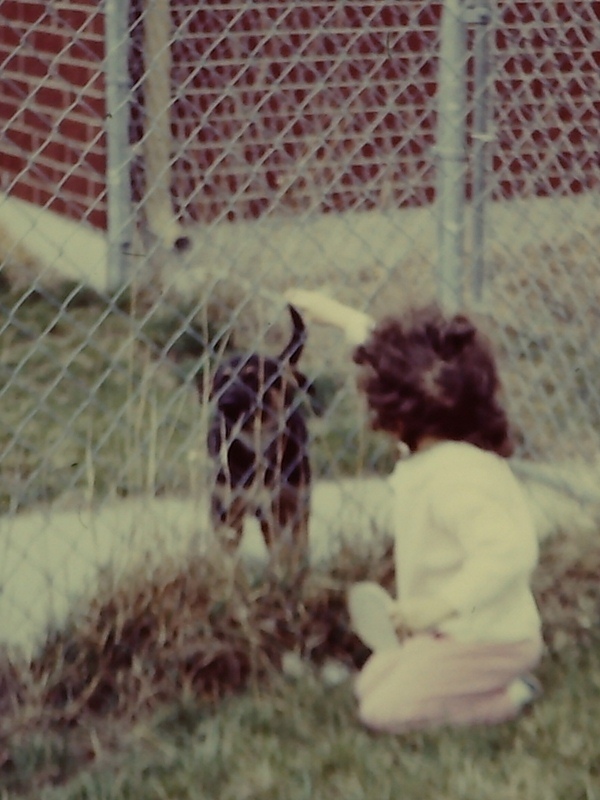 Anyway, this pic was likely taken in Independence, Kansas some time around 1972, if I were to guess. 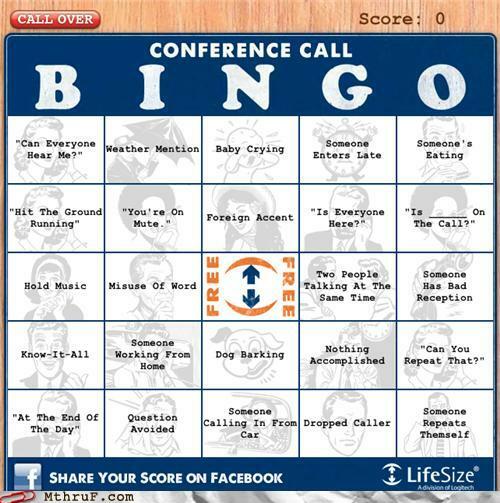 Now that I don’t work from home, I don’t have to endure conference calls. I think the most interesting conference call I ever had to endure (for me) was the one I spent in my downstairs tiny powder room, notes on the toilet lid, huddled on the floor with my St. Bernard because there was a tornado warning for my neighborhood. It was hailing and everything, but still I had to be on the conference call. So not worth it. 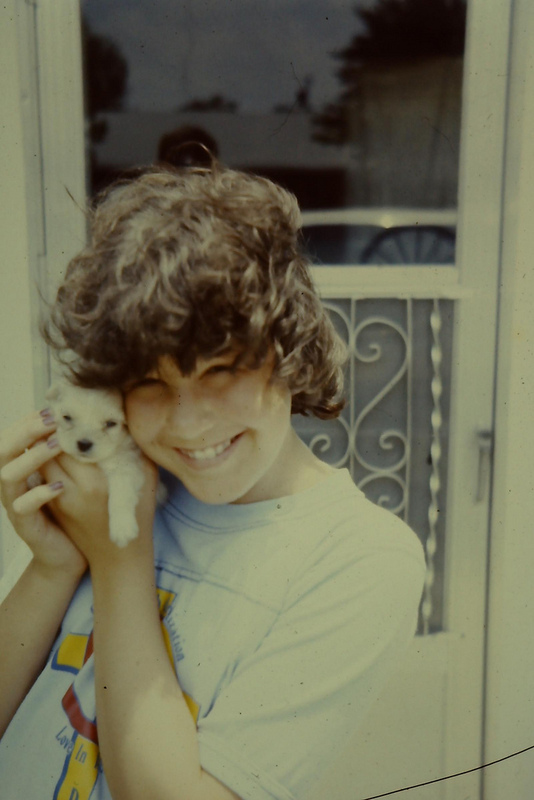 Back in the summer of 1981, I was turning 13. My birthday is June 22, so when my parents loaded me and my brothers up in the car and took us to another town to “shop for fireworks” I was a bit annoyed. Boys cared about that, not me. And it was too early anyway! But it was all a ruse. 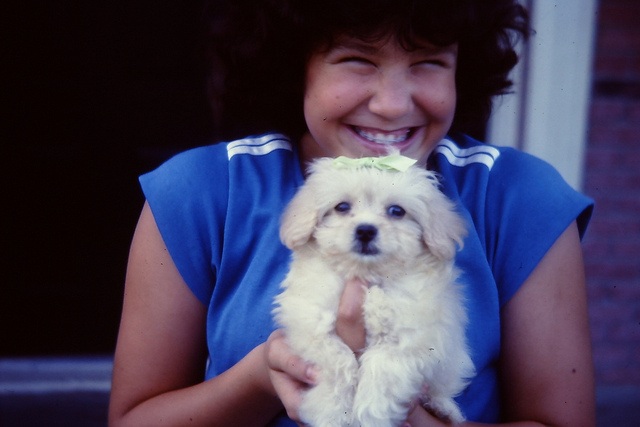 I was being taken to pick out my birthday present – a puppy! 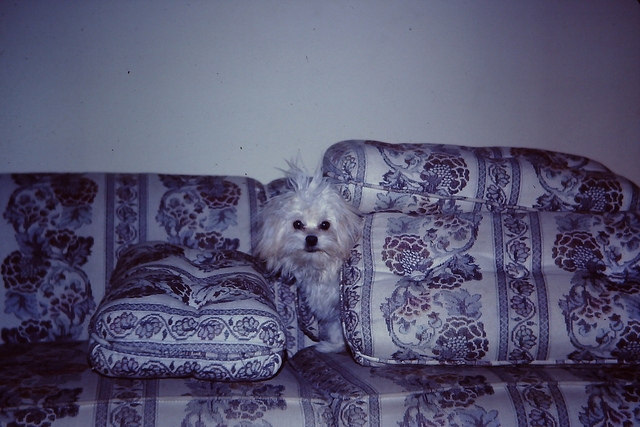 The litter was half poodle and half pekingese – 30 years before the designer dog craze I had picked out a pekeapoo named Taffy. We had to leave her to grow a bit more… here’s what she looked like when we were finally able to bring her home. She was always a good sport. 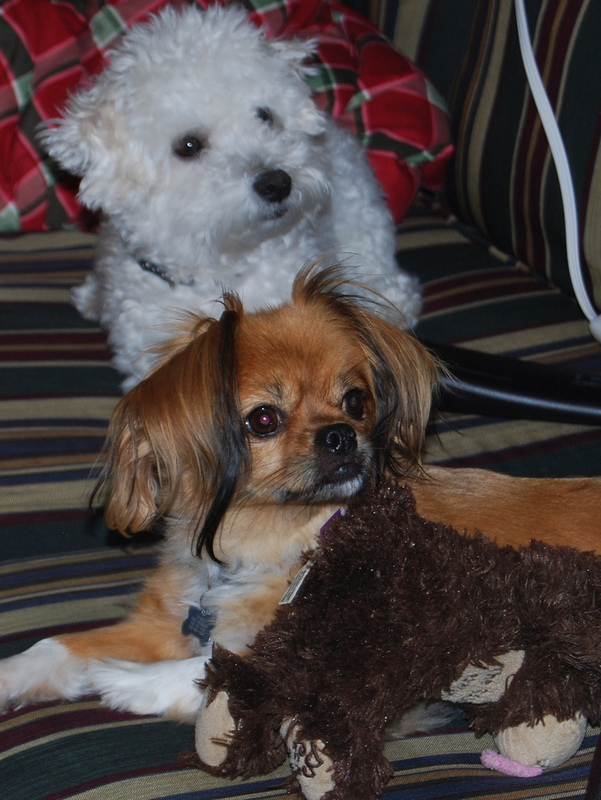 Later in high school we got another dog, and Taffy never liked her. She hid a lot after that. 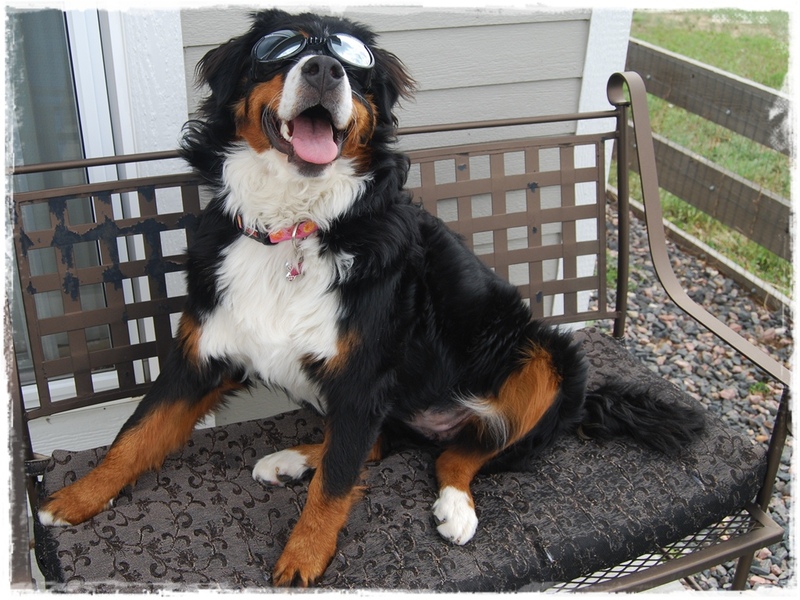 She lived until I was about 25 years old, when we had to put her down due to brain cancer. She was a good dog. 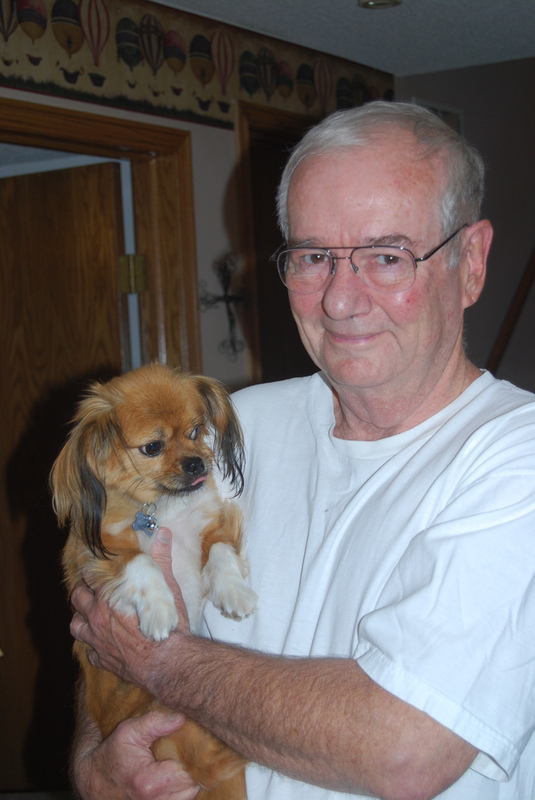 Get well soon, Milton Burrow! Poor Milton got bit by a snake! On his knee! Get well soon, sweet guy! Got to see Sparky on my recent visit home. My parents still absolutely love their precious Sparkle n’ Shine. He really is cute. Murphy liked Sparky but Sparky rarely returned the favor. We got them together once in a while though. This blog only gets about three readers, but they’re all quality! 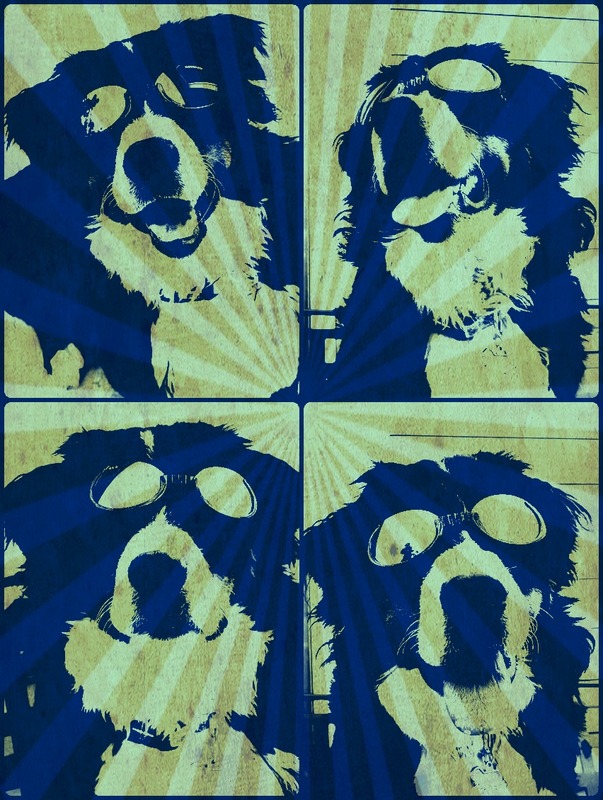 One of them, Hanson Anderson of Weird Dude Blog, made this out of Kiwi’s Doggles collage, and I love it. 🙂 Click for big.